Optimization is a program transformation technique, which tries to improve the code by making it consume less resources (i.e. CPU, Memory) and deliver high speed. The output code must not, in any way, change the meaning of the program. Optimization should increase the speed of the program and if possible, the program should demand less number of resources. Optimization should itself be fast and should not delay the overall compiling process. Efforts for an optimized code can be made at various levels of compiling the process. At the beginning, users can change/rearrange the code or use better algorithms to write the code. After generating intermediate code, the compiler can modify the intermediate code by address calculations and improving loops. While producing the target machine code, the compiler can make use of memory hierarchy and CPU registers. 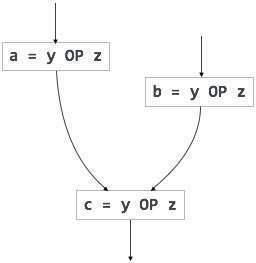 Optimization can be categorized broadly into two types : machine independent and machine dependent. should not only save the CPU cycles, but can be used on any processor. 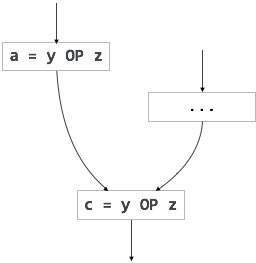 Machine-dependent optimization is done after the target code has been generated and when the code is transformed according to the target machine architecture. It involves CPU registers and may have absolute memory references rather than relative references. Machine-dependent optimizers put efforts to take maximum advantage of memory hierarchy. Source codes generally have a number of instructions, which are always executed in sequence and are considered as the basic blocks of the code. These basic blocks do not have any jump statements among them, i.e., when the first instruction is executed, all the instructions in the same basic block will be executed in their sequence of appearance without losing the flow control of the program. A program can have various constructs as basic blocks, like IF-THEN-ELSE, SWITCH-CASE conditional statements and loops such as DO-WHILE, FOR, and REPEAT-UNTIL, etc. First statement of a program. Statements that are target of any branch (conditional/unconditional). Statements that follow any branch statement. Header statements and the statements following them form a basic block. A basic block does not include any header statement of any other basic block. 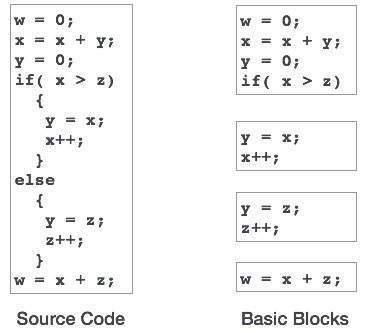 Basic blocks are important concepts from both code generation and optimization point of view. Basic blocks play an important role in identifying variables, which are being used more than once in a single basic block. If any variable is being used more than once, the register memory allocated to that variable need not be emptied unless the block finishes execution. 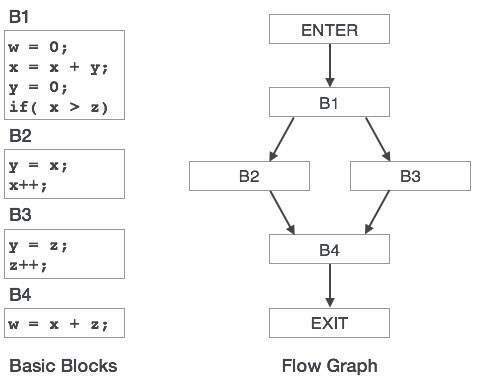 Basic blocks in a program can be represented by means of control flow graphs. A control flow graph depicts how the program control is being passed among the blocks. It is a useful tool that helps in optimization by help locating any unwanted loops in the program. Invariant code : A fragment of code that resides in the loop and computes the same value at each iteration is called a loop-invariant code. This code can be moved out of the loop by saving it to be computed only once, rather than with each iteration. Induction analysis : A variable is called an induction variable if its value is altered within the loop by a loop-invariant value. Strength reduction : There are expressions that consume more CPU cycles, time, and memory. These expressions should be replaced with cheaper expressions without compromising the output of expression. For example, multiplication (x * 2) is expensive in terms of CPU cycles than (x << 1) and yields the same result. Or if executed, their output is never used. Thus, dead code plays no role in any program operation and therefore it can simply be eliminated. There are some code statements whose computed values are used only under certain circumstances, i.e., sometimes the values are used and sometimes they are not. Such codes are known as partially dead-code. The above control flow graph depicts a chunk of program where variable ‘a’ is used to assign the output of expression ‘x * y’. 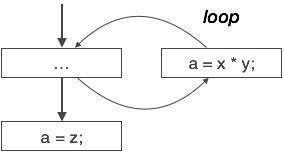 Let us assume that the value assigned to ‘a’ is never used inside the loop.Immediately after the control leaves the loop, ‘a’ is assigned the value of variable ‘z’, which would be used later in the program. We conclude here that the assignment code of ‘a’ is never used anywhere, therefore it is eligible to be eliminated. 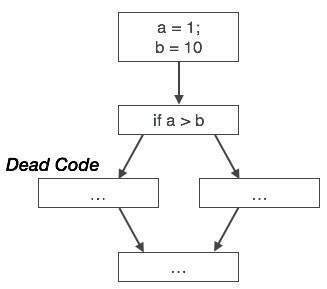 Likewise, the picture above depicts that the conditional statement is always false, implying that the code, written in true case, will never be executed, hence it can be removed. Loop-invariant code is partially redundant and can be eliminated by using a code-motion technique. Here, whether the condition is true or false; y OP z should be computed only once.